Beth Chatto believes you can transform a shady spot with easy-care planting that includes foliage and flowers for a brighter Spring garden. Illuminate a shady spot under trees with a range of flowers and plants. Forget-me-nots are flowering all over my back garden at the moment from self-sown plants. Bluebells can be white as well as blue or even pink. They normally grow in shady woodland and will flower without sun. They also spread quite quickly particularly the thuggish Spanish variety. Do not take wild bulbs from there natural habitat. Hellebore the Lenten Rose is another shade loving plant that is happy under trees although the flowers tend to hang down and be hard to inspect. Tulips can brighten the darkest spot. I plant them in pots so I can move them to where they will have the greatest impact. I can then replace them with other plants later in the year. Spring is known for colourful bulbs and primula but there are many top shrubs that provide great colour in spring. 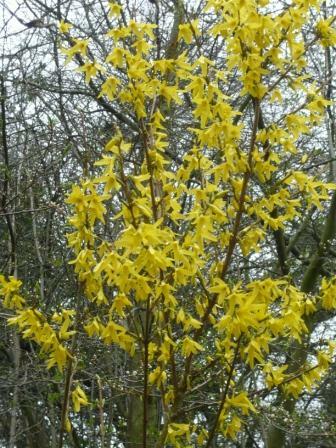 Forsythia The yellow flowering twiggy shrub that can grow to 10 feet. It flowers before the leaves form and is a strong, bright yellow. Large blossom varieties are now being cultivated but either way you get a mass of bloom. Rhododendron Evergreen shrubs of many forms and sizes from 12 inches to 12 foot. Some bloom from March and some in May. Many sizes and colors exist and one range is named after Snowwhite’s seven dwarfs. Ribes sanguineum Red Flowering Currant 6′ by 4′ This easy deciduous shrub flowers in panicles of red or pink in March and April. Lilies – Soak in water water for an hour lay sideways on a bed of grit and shade the root run. 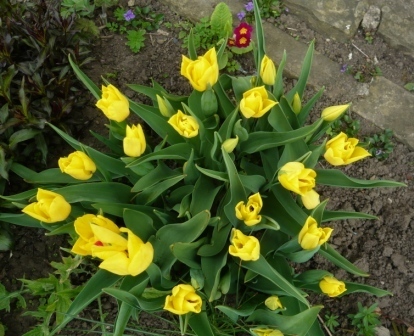 Daffodils – Feed with tomato fertilizer as they finish flowering and leave leaves for 6 weeks. Miniature DAffs are now very trendy but if you have the space go for King Alfred. Clematis – Plant 6 inches deeper tha the top of the rootball and keep roots cool. Sweet Peas – Train the strongest side shoot not the main stem for show blooms. Primulas – Mark plants in flower if you want to split them in June. 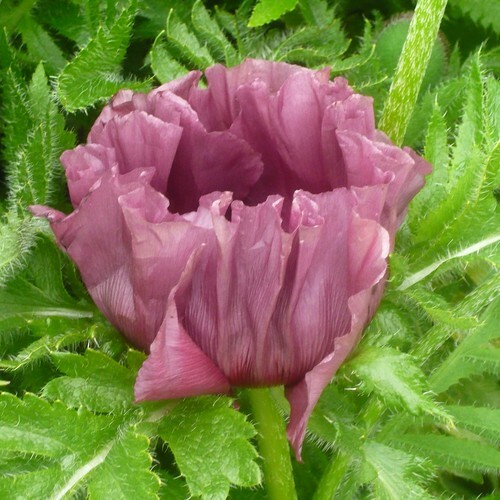 Poppies – Cut oriental poppy foliage right back after flowering and stake early. Irises – Plant in groups of 3-5 to make quicker clumps. If you need a stream of ideas of plants for your waterside look no further. For bog gardens or the streamside there are many plants that will be happy with damp roots. This is our selection of the flowering plants that will grow well in a waterside position. Iris is one of the most popular waterside plants with several varieties suitable for this position including, Iris ensata Gracieuse’, Iris pseudacorus and Iris sibirica ‘Silver Edge’ . Ligularia The Rocket has yellow flower heads held well clear of the foliage. Very architectural with its sturdy, upright habit giving good reflection in the water. Astilbe ‘Rheinland’ or Astilbe x arendsii ‘Spinell have wonderful plumes of flowers and love the damp conditions. Lysichiton camschatcensis The Giant white arum has beautiful white, arum-like flowers which are slightly later than yellow Lysichiton americanus. With smaller leaves it is a better plant for a small pond or bog garden. Slow to establish but very hardy. One of the most interesting aspects of gardening is the combination of colours that can be achieved by accident or design. Leaves and bark can play their part but it is the bold colours of some of our favourite flowers that take centre stage.